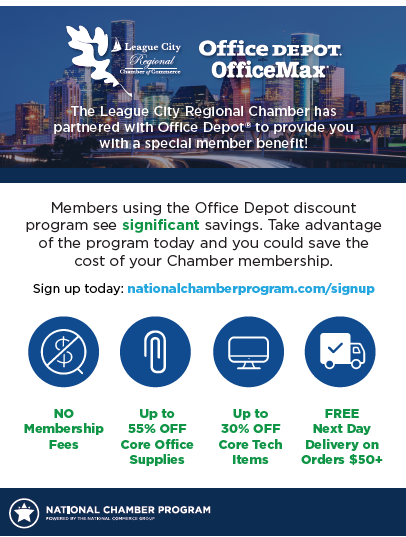 The League City Regional Chamber of Commerce has partnered with Office Depot and the National Chamber Program to provide members significant savings on thousands of business essentials. The savings are so big that many participating companies save the entire cost of their Chamber membership through the program. The National Chamber Program is a $100 million group purchasing organization composed of over 1,000 chambers of commerce across the country. This powerful buying power allows hundreds of current League City Regional Chamber members to save thousands of dollars every month on virtually every office essential item. 2. Text LeagueSPC to 555-888 to receive your store purchasing card, good for in-store purchases immediately or click here and print your card. You can have it laminated FREE in our stores.